Top Saigon Restaurant has barely been open a month, but it already has one thing going for it -- impeccable location. 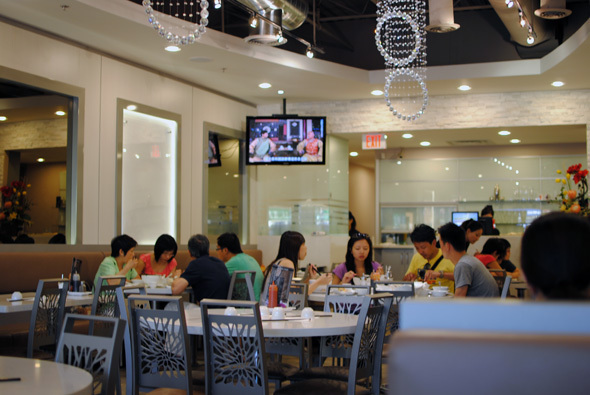 Tucked inside a bustling plaza at the corner of Finch and Leslie, Top Saigon is one of only two pho establishments within nearly a 7 kilometre radius. Obviously, somebody believes there's a niche here that nobody has gotten right. A previous restaurant (Ricepaper) serving almost the exact same fare shuttered in this same plaza not more than six months prior. Top Saigon clearly does not plan to befall the same fate. Walking into Top Saigon, I immediately notice the pseudo-contemporary look so ubiquitous amongst low-mid end Asian restaurants these days. Budget decorating strains aspirationally for modern design; hard edges and surfaces abound under the exposed ceiling. The final result is an inoffensive interior that although clean and practical, sacrifices warmth for atmosphere. Also, the chandeliers are nice enough, but (to me at least) scream the owners are more likely from Hong Kong than Ho Chi Minh City. 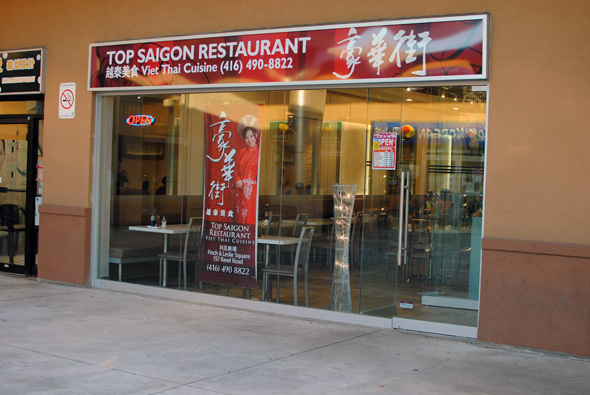 The menu at Top Saigon is eclectic, consisting of Thai, Malaysian, Chinese and Vietnamese cuisine. The multicultural tome sets off my alarms that this meal will either be amazing or terrible with little room for a result in-between. Despite the myriad interesting options, with Saigon in your restaurant name you better serve solid pho. We elect to stick with the basics when ordering. 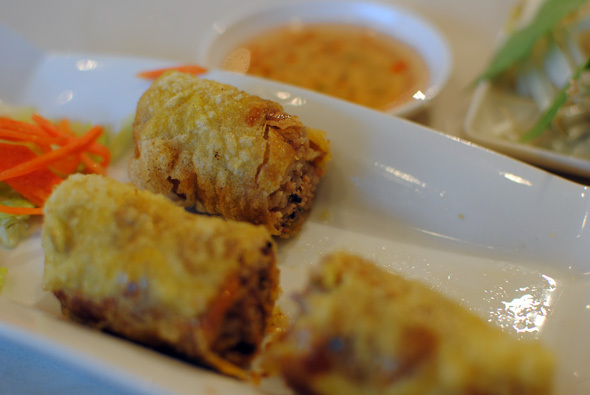 Fried spring rolls ($4.99) arrive crispy and piping hot, stuffed with chicken, shredded pork, carrots and a hint of shrimp. The texture is faultless and each bite is satisfyingly crunchy, but the internals are bland and flavourless, tasting almost solely of the fish sauce accoutrement. 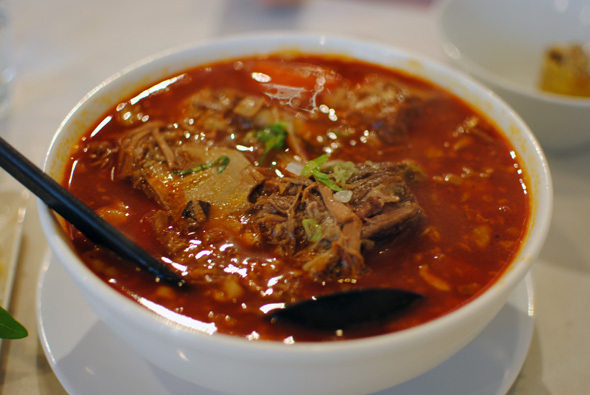 Beef brisket in tomato soup ($6.99) is a somewhat rare treat and doesn't skimp on the meat. The small sized bowl of red broth has the viscosity of motor oil but tastes pleasantly of ketchup and sesame oil. The brisket, although generously portioned, is a bit too lean and slightly overcooked. Finally, a medium pho with rare beef and tendon ($7.99) arrives in a bowl that seems indistinguishable in volumetric size from my companion's small sized portion. The tendon is basically non-existent and the beef seems to have been rolled into a ball before being frozen, then thrown into my soup to thaw. The meat tastes enough like beef and is adequately uncooked when it first arrives, but the texture is, for lack of a better word, mysterious. It's akin to thinly sliced hot pot beef pounded repeatedly with a tenderizer; not exactly a prime cut of meat. Redemption comes in the pho broth itself. Clean, clear and filling our senses strongly with aromatic star anise, the soup is light and flavourful without beating us over the head with sodium. Service is forgetful and the food was more hit than miss. Still, it's tough to judge a restaurant when it's this new, particularly when sampling but a slice of its diverse menu. Hoping to give it another shot, this past weekend I walked by again and Top Saigon was full to capacity during its official grand opening celebration. I couldn't get a table. Food schmood, you know what they say -- location, location, location.